Metrics and Models gives a brief summary on some major software development methodologies, as well as process standards. The bulk of the book is textbook material on how to design, execute, and interpret the results of measuring software quality. If you're asked to design a measurement or process assessment program, this text could help. But if you're more interested in how to manage teams for improvement aided by carefully-chosen metrics, instead read Measuring and Managing Performance in Organizations by Robert D. Austin. Full disclosure: I only read the first two chapters and glanced through the rest. 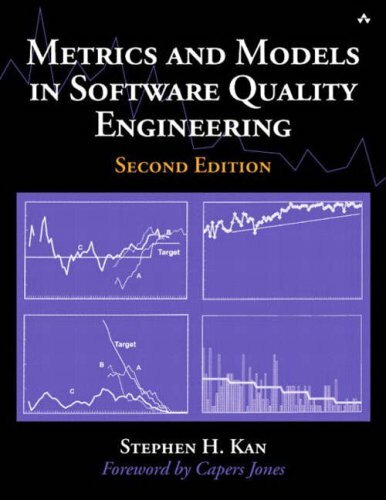 Stephen Kan's extensive experience applying "scientific methods" and measurement to the management of software development gives this book a real world practicality not found in many similar books. Anyone interested in becoming software management professional should certainly read this book and take its lessons to heart. His treatment of software defect containment practices and metrics is especially valuable. Good overall review of metrics and methods. A very thorough treatment of Software Engineering metrics.Good graphics.Good explanations.Much better than other books in this area. This book is a must have for all the managers and profesionals that need a complete and detailed reference for software metrics.It provides clear explanations and examples.It is very easy to read and very practical. As the System Test Team Leader for the Quality Technology area, I had to certify many of the tools and procedures used by Stephen Kan.Prior to that, as a System Administrator, I had to run software metrics on those tools, like those shown in table 6.3.As a design review moderator, I was charged with leading a number of IR, IE and I0 reviews. I can attest personally to the great effort and many find minds that worked together to develop and implement fine tools such as DCR, PTR, PTF and APAR, as well as the brilliantly simple, effective ways of implementing Continuous Quality Improvement techniques such as DPP.What Kan has written is real-world honest and true, not some academic exercise. Kan is dead-right on the money.If you want to track, predict and manage things in the real world, this is how you do it.At PSQT '97, Tom Gilb told me that SEI should create a new CMM "Level Six" designation for the way Kan and the others at IBM Rochester have dealt with software quality.That's how good the stuff in this book is. I am particularly impressed by how Kan has woven in not only his work and IBM Rochester as a whole, but also the work of others throughout the industry in such a simple, clear, easy to understand manner. Yet, given that the book is an easy read, that many of the techniques are easy to do, and that I see this book on the shelves of many IT managers, it baffles me why so few people and so few companies actually implement this stuff.I suspect that politics and corporate culture is what's holding back so many companies from enjoying the success, efficiency, and frankly the FUN of working in a continually measuring, continually refining work environment such as Kan describes. For example, Defect Removal Effectiveness is a very simple metric to gather.In a typical medium sized software company, or in the I.T. department of a large company, the head of testing and the head of phone support could easily enough get together and compare the number of bugs found in testing the last release with the number of bugs found in the field after that release was deployed.Both areas already have their problem logs, and if they can't directly pull counts and totals, it's typically only a few minutes work for the right programmer.So what's the hold up?It's not that the metric is hard to understand, or an academic exercise, or that the numbers are hard to get.It's that people have a hard time admitting that "their baby is ugly".The good of the company, stopping bugs from getting to the field, conflicts with the good of the testing manager, who doesn't want to risk admitting that problems got past them. Therefore, I think it would be a fine addition to this book if Kan could write another chapter which deals with the human side of the equation.The book thus far presumes an interest in software metrics and appropriate management support from the top levels down.What would move this book from worker's bookshelves to their desks, and keep this book open and used on a daily basis, would be some ideas on how to garner and build support for implementing software metrics and TQM practices across an organization.People want to do this; that's why this book gets sold.Unfortunately, people aren't empowered to do so, which is why many times this excellent book sits on a shelf. Its a good read, but its a shame if they are still using this book in school, so much more about quality is discovered every year. Great for basics though. 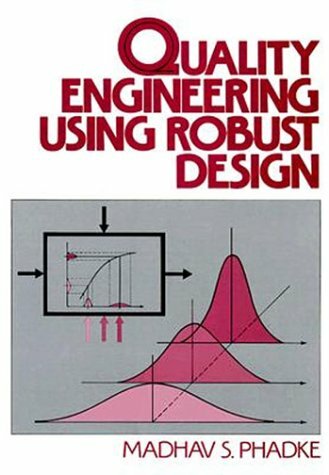 Dr. Phadke has written the most clear book on the Robust Design method.I was able to follow the book with medium statistical and engineering knowledge and gained valueable knowledge.This is a must read for all engineering managers! Phadke gives a versatily, easy to read introduction into the on-target philosophy and the Quality Loss Function. Many examples are taken from real case studies (e.g. from Xerox and ITT), covering mechanics, electronics and computer systems. These are good to inspire your own improvement projects. Unfortunately, the most verstile characteristic is not treated (dynamic characteristic). A good starter for engineers getting into Robust Design. If you're reading this, you probably need this book. This is about the only publication of Taguchi's theories that you'll be able to buy for pocket-change. Though I haven't finished it yet, it strongly resembles the contents of a seminar that used to cost more than $3,000 -- if you can remember how to use a textbook, then this is a bargain. If you've had advanced algebra, intermediate stats, or basic calculus, you should be able to handle the equations. Taguchi's breakthrough is to evolve a method of quasi-statistical analysis (strongly resembling some elements of catastrophe theory & chaos dynamics) that can efficiently pare a multivariate real-world problem down to small handful of most-likely sets. Don't think assembly lines here. I was introduced to Taguchi as a possible solution for consulting on how to best apply a shrinking advertising budget: you've got X dollars for the year, you can expand/cut staff, you can do billboards or flyers, TV large- or small-market, peak or way-dark hours, direct mail or Internet... or some combination of varying amounts. In short, constraining each variable to a few choices, & with a finite budget, still left literally millions of possible combinations. This book is a great compendium of the QE skills set.It is very weak on the Statistical skills that the ASQ certification test demands. Why I initialy purchased it as a study aid, I have found it to be an excellent resource providing practical examples for on the job use. New @ asq.org for less. Why is it so much higher here? 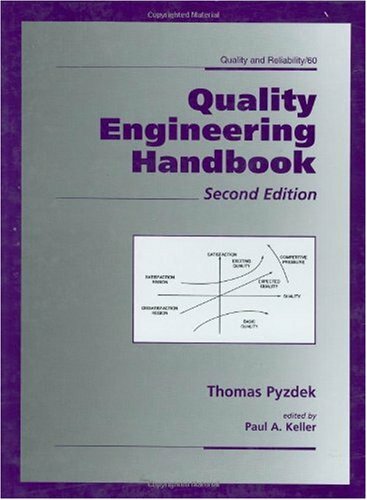 As other reviewers mentioned, Pyzdek can help you make it over the CQE exam hurdle. In fact it is probably helpful for those who wish to clear the CQM or CQT hurdles. It may aslo be a helpful supplament for Six-Sigma folks. The volume also serves competently as a handbook and reference. Importantly, it includes an adequate bibilography so that the reader can easily pursue more specialized or more fundamental soruces. Neither the material nor the presentation distinguishes this book from its many competitors. Too often the index enties have incorrect page numbers. In an age of computer automated indexing, mistakes of this kind really grate on a reader who expects more. Further, a quality handbook should set a better example! The text is very informative and easy to read. Sections are arranged so anyone that anyone from a novice QE to a seasoned "lifer" can easily access pertinent information. Not only a good training tool,it also makes a great reference manual. Well I passed the exam, the book helped a lot. More detailed information is required for this course but the book explains all the essential concepts. I decided to take the ASQ CQE exam in order to improve my prospects of finding a new Quality Assurance position. There were many areas of quality that I knew very well due to my previous job responsibilities, however there were a few areas I knew needed some attention. This book was very helpful in both preparing me for the exam, and serving as a reference during the test. It is presented in such a way that follows the Body of Knowledge,chapter by chapter. I was expecting the test to be very difficult, but was able to pass on my first attempt. The financial markets industry is at the same crossroads as the automotive industry in the late 1970s.Margins are collapsing and customization is rapidly increasing. The automotive industry turned to quality and its no coincidence that in the money management industry many of the spectacular failures have been due largely to problems in quality control.The financial industry in on the verge of a quality revolution. New and old firms alike are creating new investment vehicles and new strategies that are radically changing the nature of the industry.To compete, mutual funds, hedge fund industries, banks and proprietary trading firms are being forced to quicklyy research, test and implement trade selection and execution systems.And, just as in the early stages of factory automation, quality suffers and leads to defects.Many financial firms fall short of quality, lacking processes and methodologies for proper development and evaluation of trading and investment systems. Authors Kumiega and Van Vliet present a new step-by-step methodology for such development.Their methodology (called K|V) has been presented in numerous journal articles and at academic and industry conferences and is rapidly being accepted as the preferred business process for the institutional trading and hedge fund industries for development, presentation, and evaluation of trading and investment systems.The K|V model for trading system development combines new product development, project management and software development methodologies into one robust system.After four stages, the methodology requires repeating the entire waterfall for continuous improvement. The discussion quality and its applications to the front office is presented using lessons learned by the authors after usingthe methodology in the real world.As a result, it is flexible and modifiable to fit various projects in finance in different types of firms. Their methodology works equally well for short-term trading systems, longer-term portfolio management or mutual fund style investment strategies as well as more sophisticated ones employing derivative instruments in hedge funds. Additionally, readers will be able to quickly modify the standard K|V methodology to meet their unique needs and to quickly build other quantitatively drive applications for finance.At the beginning and the end of the book the authors pose a key question: Are you willing to change and embrace quality for the 21st century or are willing to accept extinction? The real gem in this book is that the concepts give the reader a road map to avoid extinction. * Best practices along the step-by-step process will mitigate project risk, model risk, and ensure data quality. I feel bad about docking a point from a book that is original, thoroughly planned, meticulous and engagingly written. My reservations are about its practical value. The authors envisage a guide for students entering the field of investment management. Those about to set up and run their own investment companies, or at least head up a team at one, will discover a valuable aid. The rest might be disappointed. In my experience, people specialize, newbies start in junior, supervised roles and learn on the job. Much of the book's content will be useless for non-managers (non-CEOs, even); the rest are things that I would expect to come with common sense (all the consultingspeak) and modest amount of experience. Does a hedge-fund principal need to consult "Quality Money Management" on how to write the prospectus? Does a research-team leader need to be explained the importance of clean data or the concept of backtesting? Does a researcher need to be reminded to use a consistent notation in his/her write-ups? If any of those is looking for a book, wouldn't a specialized reference be a better investment? One-of-a-kind, thoughtful, methodical, educational - but not exactly bread-and-butter useful. I thought this book was going to be about 'money management' in the sense that it is usually referred to in the automated trading system community, ie about risk control and position sizing, etc..those topics are briefly discussed in a very general sense but are far from the topic of this book. The actual content of the book is more akin to a process management book for trading systems, it borrows heavily from (and often misinterprets) software development and industrial process methodologies such as waterfall, agile, lean, etc.. Overall the book is very general and very light on specific content, perhaps it could be of some use to a manager with no prior exposure to trading systems or software development, but I would definitely not recommend it to a developer. Excellent framework for systematic trading process. Quality Money Management (QMM) is an excellent book, providing a framework for business systems processes in asset management firms. QMMoffers method and structure aiming for "best practices" for investment management firms. This is a excellent work for those rolling out a new strategy, fund offering, or business line. The focus is on systematic trading, but many of these processes are adaptable for custody chain or decision making for more discretionary investment methods, however the emphasis is on complex market microstructure and the developing, testing and managing portfolios of a new trading system. Emphasis is additionally on financial software and human interface with software, so this is an excellent resource for those who support or develop application for traders. The cycle of "continuous improvement" is as old as Edward W. Deming's pioneering work in the 1950s, however it is refreshing to see it applied to making systematic trading smooth. This is an excellent book for improving a framework in place, or for starting from scratch. Quality Money Management is a very timely book meant to bring quality control processes to the trading process. It provides a detailed look at using well-known product development processes in the finance community. Variation is a big weakness of any system that could undercut a great trading strategy. After all, one cannot foresee all possibilities. 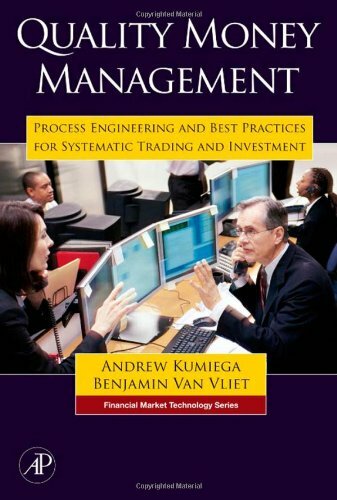 The use of a systematic approach that addresses development phases requiring management involvement and extensive testing prior to deploying a new trading system is a unique aspect of this book. As a former six sigma black belt at a Fortune 500 company overseeing product development and quality control who utilized similar processes, it never ceases to amaze me how much money is lost in the transactional processes that govern financial institutions. One would do well to apply these principles in an adapted form at their financial institution for trading systems, risk management systems, and model development...a paradigm shift indeed. I would recommend this book to anyone who wants to improve their margins with a very cost effective solution. Although at first look this book may seem overwhelming with lots of mathematical interpretations of quality, however, if you give the book a chance you will realize this book is in fact very basic and extremely easy to follow.Statistics may be intimidating to a person of any profession (engineer, general business or even managers) but the book really takes you from step one and gives a broad understanding of quality.The author of this book tries to offer the mathematical tools to people to improve their understanding of quality.The book also does a fabulous job of talking you through the history of quality(the gurus of quality and their systems) to the new quality processes, such as ISO and Six Sigma.Once I completed this book I understand the reasoning for having the mathematics as such a large part.How can one analyze quality without a statistical background?This book not only breaks things down very simply for a person but also gives a full understanding as to why each topic covered is essential to learning proper quality management.I truly hope to pursue a career in quality after reading this textbook.It takes very difficult topics to grasp (which are essential to todays business world) and makes the information understandable and accessible to a beginner as well as a great refresher. An introduction to the Taguchi methodology as a systematic strategy for designing product and process tests that will reduce product or process variation. This text aims to make this method understandable to all professionals in quality control and non-statisticians and it does this very well. Having been educated from an engineering perspective I found these ideas were in common usage, however the techniques were not applied to organisations, especially services until the mid 90s through the influence of Lean Manufacturing and a mature quality movement. I have been a fan of Taguchi methods for some 16 years now due to their simplicity and understandability. Dr. Taguchi gave all engineers a great gift when he took statistical design of experiments(DOE) out of the realm of esoteric statistical academia and made it digestable for the average engineer. Mr. Ross has furthered this noble effort by writing an easily-read compendium explaining DOE per Taguchi's approach! Highly recommended! Maybe the most known and recurrently used Taguchi techniques are the Orthogonal Arrays for DOE; but they're not the only ones that Taguchi developed in order to achieve a quality product design. The Loss Function, the S/N ratio and the Tolerance Design are part of the "Robust Engineering" that consolidated Taguchi as the quality guru he is. Many general DOE concepts are so well explained in this book that it represents a great introductory text to this subject. Nevertheless this is a Taguchi techniques book, not a complete DOE text, so it's possible that you'd like to look for "Design and Analysis of Experiments" by Douglas C. Montgomery. 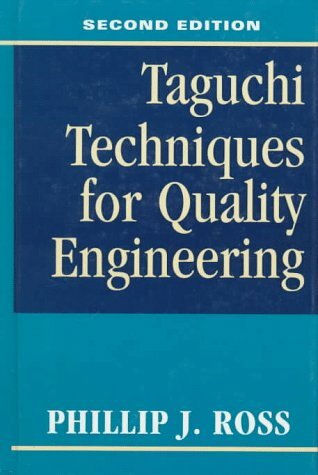 This book is highly valuable if you want to understand the Taguchi philosophy for developing quality products and a must have for DOE beginners. Seems to be written for people with no background in designing experiments.Gives you a good start and gives you the basic information on Taguchi methods.A favorite of Engineering students since it is extremely easy to follow.Great first book for someone starting out with Design of Experiments.Covers the full problem solving process with DOE being a part of the process. Joseph M. Juran is among the founders of modern quality management, so his handbook, after several editions, should be a great reference. And it is. It covers everything from statistics to people, countries to industries to methods. How to think about it and how to do it. And readable too. Now, at over 1800 pages (48 chapters, 5 appendices), this is not a book to read from beginning to end. But it's much more than an encyclopedia to sit on your shelf. Think of each chapter as a readable textbook. Choose your topic and read a chapter. Novices will get a complete introduction; professionals can use the organized and complete explanations to refresh their own understanding or to explain quality management and improvement concepts to others. 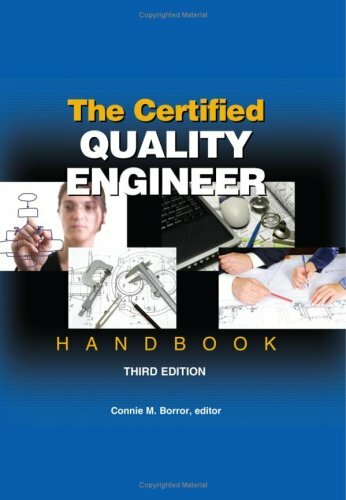 Isn't this a requirement for being a Quality Engineer?This book helped me get Certified Quality Engineer status. 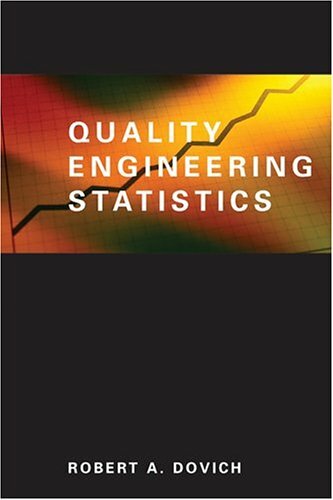 If you are in Quality Assurance management or Quality Engineering this is the ultimate reference book. It covers everything from quality planning, training, strategy, and statistics to six sigma and Kaizen concepts. Not a lot on CAPA or Risk Analysis. A good portion of the text is devoted to statistics and sampling and the explanations and examples for these are helpful. This is an all around general reference book which is good to have on hand for certification test preparation. For decades Joseph Juran has been a famous name in the quality movement. 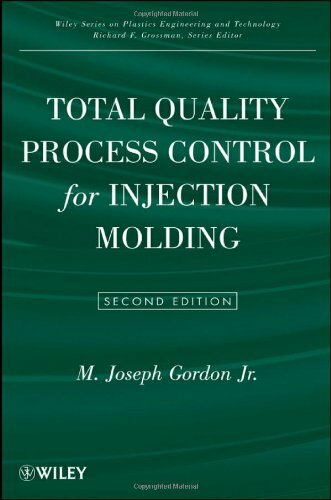 He formed his own institute for quality and has for many years edited an extensive volume on methods for improving quality in manufacturing processes. 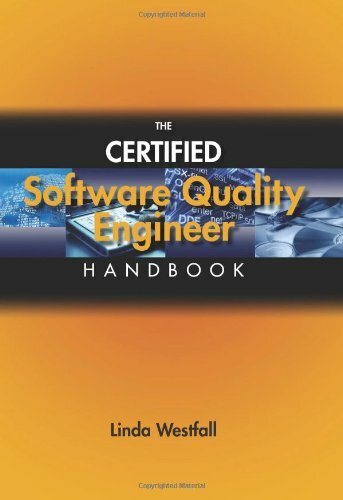 This Quality Handbook, now in its fifth edition has long been the basic reference for quality engineers and statistician alike. 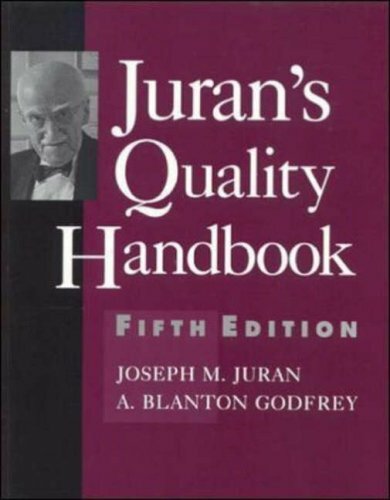 To honor Juran, the fifth edition is titled Juran's Quality Handbook. The volume is now over 900 pages and consists of 48 chapters and 5 appendices. There are 53 authors including Juran himself and his colleague and co-editor Blanton Godfrey. Many other well-known persons have contributed. It includes a chapter on government services by Vice President Al Gore. Prominent statisticians who have contributed include Don Marquardt, Stu Hunter, Bill Meeker, Luis Escobar, Gerry Hahn, Ed Schilling, Ed Dudewicz and Necip Doganaksoy. As a statistician, I particularly like having a wealth of practical statistical information and tables in one source. Dudewicz provides the introductory statistical material necessary to understand the four other statistical chapters that follow it (SPC by Wadsworth, Acceptance Sampling by Schilling, Design and Analysis of Experiments by Hunter and Reliability Concepts and Data Analysis by Meeker, Escobar, Doganaksoy and Hahn). These are all distinguished authors who are excellent writers and several have written whole text books on these subjects. This edition is up-to-date with the latest advances in quality techniques. Statistical advances in robust design (Taguchi methods), bootstrap methods, process control and capability are all included. Juran and Deming had major practical impact on the quality movement because they both emphasized the need for proper process management. This can be seen in many of the non-statistical chapters that deal with successful management techniques such as six sigma. This edition is even better than the previous editions and is indeed worthy of the title of bible. Despite the high cost this book is prominent on my bookshelf. I recommend it to anyone heavily involved in product reliability, even if they own copies of previous editions! "Juran's Quality Handbook" is an excellent book on Quality by one of the most well known quality gurus. 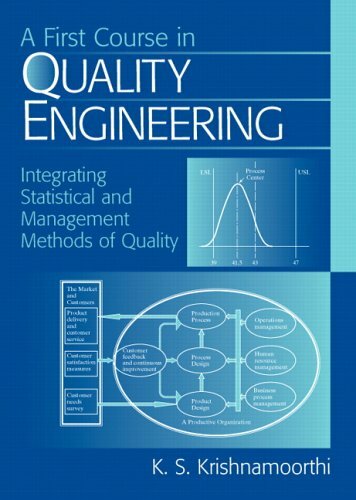 The book gives a comprehensive coverage of the subject of quality management. It includes the latest techniques on quality as well as quality theories. This is a very useful book for those who are interested in producing quality goods and services in a customer focused organization. This huge tome is of immense value to all those involved with the quality profession and is an excellent reference book that covers the wide range of topics and subjects pertaining to quality. This is a well written book that is very useful for all businesses where quality matters (that is, all businesses). This should be essential reading for quality specialists such as control and quality assurance personnel. This is the best reliability book I have ever used.I work in a corporate development department and deals with design reliability and warranty on a daily basis.This book gets right to the point and is very useful for solving my problems.The Excel templates are especially useful.Not only does the book have useful examples, but the examples are solved using Excel.These examples are on the CD in the back of the book.My only complaint is the printing.The quality is not great; some of the graphs are fuzzy. 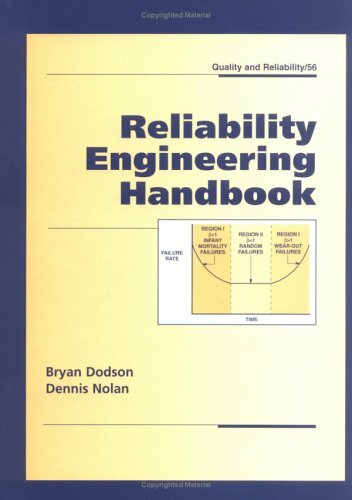 Dodson and Nolan provide a sound reliability engineering survey. It may aslo be a helpful supplament for Six-Sigma folks. The volume also serves competently as a handbook and reference. Importantly, it includes an adequate bibilography so that the reader can easily pursue more specialized or more fundamental sources. by M. Joseph Gordon Jr. Testing is usually the most expensive, time-consuming and difficult activity during the development of engineering products and systems. Development testing must be performed to ensure that designs meet requirements for performance, safety, durability, reliability, statutory aspects, etc. Most manufactured items must be tested to ensure that they are correctly made. However, much of the testing that is performed in industry is based upon traditions, standards and procedures that do not provide the optimum balance of assurance versus cost and time. There is often pressure to reduce testing because of the high costs involved, without appreciation of the effects on performance, reliability. etc. Misperceptions are commonplace, particularly the idea that tests should not stress products in excess of their operating levels. The main reason for this situation seems to be that engineers have not developed a consistent philosophy and methodology for testing. Testing is seldom taught as part of engineering curricula, and there are no books on the subject. Specialist areas are taught, for example fatigue testing to mechanical engineers and digital device testing to electronics engineers. However, a wide range is untaught, particularly multidisciplinary and systems aspects. Testing is not just an engineering issue. Because of the importance and magnitude of the economic and business aspects testing is an issue for management. Testing is perceived as a high cost activity, when it should be considered as a value-adding process. I purchased this book three years ago, when I took on work responsibility for testing and verification.After giving it a first and second read, I can safely say that it did not leave my bookshelf until I cleaned out my cube as I left for a different company. The text is informative for those who have no background in the subject of true test engineering, but for those whose industries are governed by specific, required/mandatory methodologies, this book is not of much use.It is geared primarily to testing for the electronics industry, and even then only provides a "35,000 ft" view rather than the detail one would expect from an "engineering" book.Important (some would say essential) topics for reliability engineering (Arrhenius, Weibull, etc.) are mentioned but glossed over, leaving the reader to purchase additional $100+ volumes dealing with these subjects. Again, if you're new to testing, it's a great introduction.If you have any exposure to the field, I would look elsewhere for more detailed reading. A very good book in content, O'Connor covers the major issues, provides resources and methods for driving deeper into developing appropriate test plans and does an okay coverage of test management.The book could do better from a Test Philosophy perspective, although the chapter on management comes close. The drawback is the publishers quality of reprinting the figures.At last count there were 8 figures with missing or illegible text.Mostly this is annoying and not detrimental to conveying the concepts.However, the flow charts on test management / test plans are so bad as to be nearly worthless.It could be an issue with the particular printing I have.As of this review I have attempted to contact the author and publisher, but I do not expect a response.Amazon replaced the book, but the replacement also had the problems. So would I recommend the book, yes, but only IF the figures are taken care of, otherwise I would say find a different source.If the figures are resolved then I would rate it a strong 4, maybe a 5.If the author grows the test management material then it would be a strong 5. It is the very first book (that I'm aware of) written for test engineers and managers.This book is an overview of all types of testing. "The author has never found a company or a project where it was considered in retrospect by those involved that too much was spent on a development test programme." 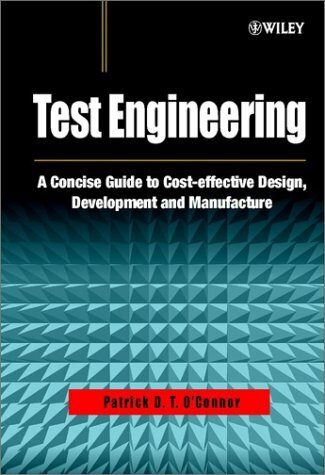 Test Engineering by Patrick D. T. O'Connor. When you consider that Chernobyl, Three Mile Island, the Comet IV and the Challenger failed not because of negligence, but because critical data slipped through the cracks, or was misinterpreted, this book may just prevent that next tragic unknown from taking place. Or at least arm engineers, and managers, as to what is taking place. Highly recommended, from one in the business. I bought this book seeking practical information relating to testing of manufactured PCB assemblies.I found relatively little information on that subject, and the information I did find was of a general nature. 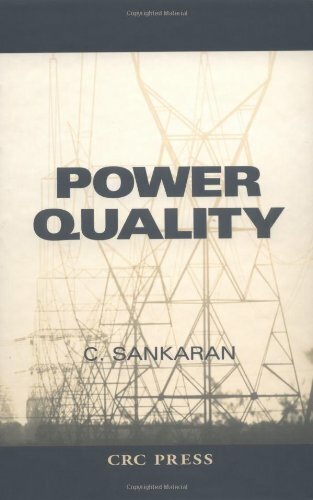 Used this as a textbook in a college course in quality assurance. 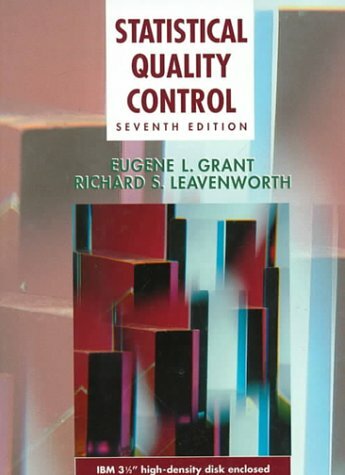 It is THE book on SPC, and other statistical issues in quality assurance and control.Well illustrated with lots of examples.Great problem sets.For many years, the recognized standard college text in SPC, and having used it as that, I see why.Recommended. Book was exactly as described (used). This book is considered the 'bible' of statistical control. I was adding it back to my library. 5 star for the book. 1 star for the price. This can be considered THE classic on the subject. It is also well written, explaining exactly what one is trying to achieve and how statistics fit that bill. As a newbie on the subject and not being a fan of math, I found this book the best explanation for the entire concept of using statistic and sampling to achieve certain levels of quality. Perhaps because it starts at the very beginning of the issue of quality and consistency, it is easy to grasp. I wanted to point out that McGraw Hill sells this book in forign markets, still in english, for less than ten bucks, paperback version. Given that, I strongly suggest one hunt around the net. This book is outdated (it comes with a floppy disk that I havn't found to work on any computer). It also provides very few examples as to grasp what is being talked about in the material. There are also (from the limited answers provided) answers that are wrong. This book is also extremely expensive for the amount of material provided. I have seen many books provide much more information for half the price. Just thought I'd chip in my own two cents since the other reviews seem oddly impresonal and similar (the two that are different). Undisputably the best for practitioners in this field! Companies worldwide have used the methods of quality expert Genichi Taguchi for the past 30 years with phenomenal product development cost savings and quality improvements. 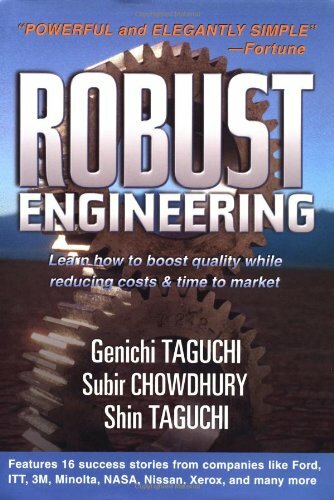 Robust Engineering, by this three-time Deming Prize winner, along with Subir Chowdhury and Shin Taguchi, is the first book to explain and illustrate his newest, most revolutionary methodology, Technology Development. It joins Design of Experiments and Robust Design as the framework on which your company can build a competitive edge. Case studies of real-world organizations Ford, ITT, 3M, Minolta, NASA, Nissan, Xerox and 9 others show you how the techniques of all three methodologies can besuccessfully applied. You'll hammer flexibility into your manufacturing organization to minimize product development costs, reduce product time-to-market, and fully satisfy customers needs. I'm also surprised by 4 stars & other praises of this book (e.g., Fortune). the book should be renamed "Case Studies of Taguchi Method" and the "authors" should be renamed as "editors"
it also does not telll you the method & its statistical basis, its strength & weakness compared with other methods, its assumptions and so forth. In addition, it lacks a biblography. Overall, we are just supposed to take a leap of faith. The book feels like "informercial"
A great advertisement, but short on implementation. I am a little bemused by the previous reviews.Being a practicing engineer, I had hoped for an more rigorous introduction to applying robust engineering principles, coupled to real life engineering examples.What I got was essentially a book length advertisement aimed at people who don't need or want to know how to do it, merely order someone else to apply the techniques.If you are a manager considering implementing robust engineering practices and design of experiments, by all means, read the book and convince yourself and your boss it is the way to go.If you actually want to use the techniques, buy a different book. Robust Engineering book is the world wide collections of best case studiesof Robust Engineering. In Chapter 1 and 2 authors gave a basic explanation of Robust Engineering and implementation strategy which is very easy to understand for any reader. This is book is the absolute necessary for anyleaders, managers or engineers who want to re-shape their organization andby reading this book they will understand the powerfulness of RobustEngineering. 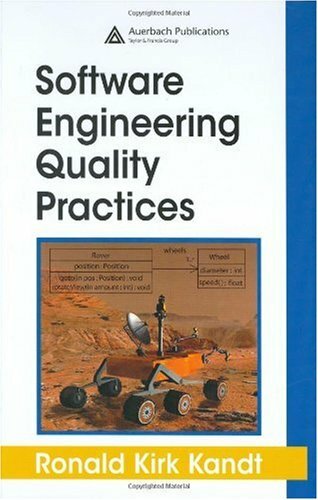 Software Engineering Quality Practices describes how software engineers and the managers that supervise them can develop quality software in an effective, efficient, and professional manner. This volume conveys practical advice quickly and clearly while avoiding the dogma that surrounds the software profession. It concentrates on what the real requirements of a system are, what constitutes an appropriate solution, and how you can ensure that the realized solution fulfills the desired qualities of relevant stakeholders. The book also discusses how successful organizations attract and keep people who are capable of building high-quality systems. The author succinctly describes the nature and fundamental principles of design and incorporates them into an architectural framework, enabling you to apply the framework to the development of quality software for most applications. 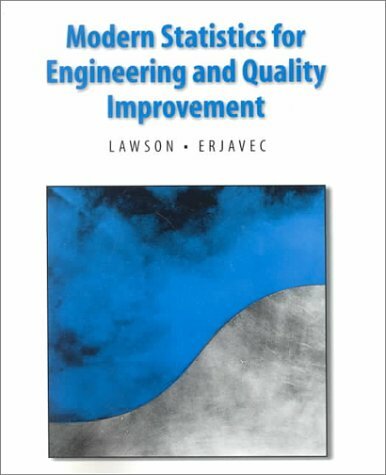 The text also analyzes engineering requirements, identifies poor requirements, and demonstrates how bad requirements can be transformed via several important quality practices. This book shipped just as promised.There were a few highlighted areas of text and you could tell it was used, but it is exactly what I was expecting and what I paid for.Shipping was quicker than I expected and I would definitely purchase form them again.Great job! 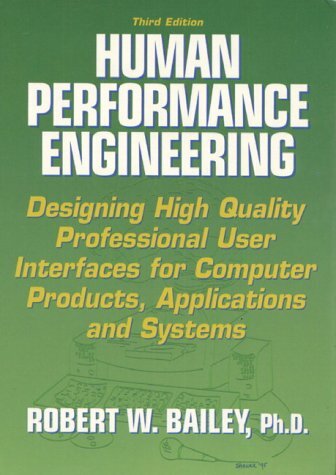 I've used this book when teaching a human-computer interaction (HCI) course in an engineering psychology program. While there are two extensive texts on HCI I found their emphasis too much on the engineering side. Bailey, while including good technical material, also provides a perspective that fits well with engineering psychology. His information combines well with that in books by Wickens. Bailey's material goes well beyond PC issues and provides good understanding of various system design techniques. For exampe, his descriptions of ATM system design gives good direction on how to do design. He provides a good foundation on such important topics as human limits, human senses, memory, usability assessment, task analysis and ways to help people work better. While this book isn't cheap, it is worth every penny (or kronor). It is on my shelf.